What can we learn about sales from the wild beasts of South Africa? A lot, it turns out. After learning about these incredible animals on a recent safari, Jill was amazed at the connection between their lives and what we do everyday. 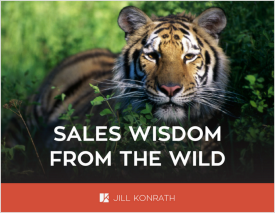 Fill out this form to get Sales Wisdom from the Wild right now. Sales Wisdom from the Wild is a refreshing break from all the "how to" sales ebooks. It really makes you think. * You'll also get Jill's sales articles, read by over 145,000 sellers worldwide, delivered straight to your inbox.